A new dimension in printing. It’s an advancement in printing you can both see and feel. Taking printing to a new level is the tactile experience provided by Dimensional Clear Ink on the NexPress. Printing Partners is proud to offer its customers the ability to give specified text and images a “raised” or 3D effect, making your next piece something unique and original in this fast-paced and competitive market. 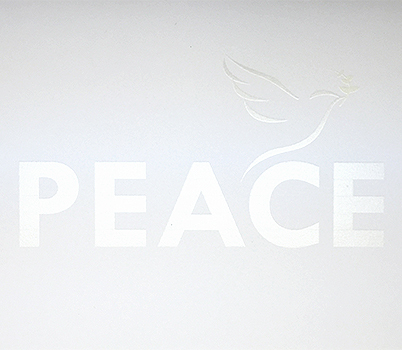 If your company could benefit from a unique mailing, consider using Dimensional Clear Ink in Dimensional Printing. Let your sales representative at Printing Partners run your fingers over some awesome examples of this innovative and inspirational technology. Your mailings — and customers’ response to them — will take on a new dimension. Dimensional Printing is just that — dimensional. By using Dimensional Clear Dry Ink in our NexPress, Printing Partners is able to create a clear, raised layer on top of an existing page. Graphics, text or a full-color image is enhanced while areas on a page with no print can also be given texture. What makes this innovation in print so remarkable is that Dimensional Printing can be set to produce variable heights on the page so that your piece can more readily mirror the look and feel of a specific image. By using this new technology along with digital printing, you truly have a feast for the eyes — and fingers. Imagine collecting your mail. You reach in the mailbox, pull out various bills and mailers and then you feel texture. You put the other mail aside and pay attention to the piece that peaked your interest. The look and feel of the piece draws you in because it offers you a tactile experience. Keeping sustainability in mind, Dimensional Printing creates prints that are recyclable. Dimensional Printing does not require any special de-inking and uses no volatile organic compounds (VOCs) so you can produce prints that are safe for our environment. The process of creating Dimensional Printing is not difficult. 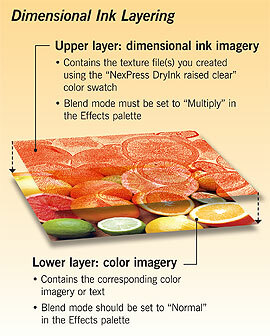 However, it can be difficult knowing what textures work best for your application and how high to raise the ink. We are making available Kodak's guide on Creating Dimensional Printing to help you with these decisions. Our designers and their experience are available to assist you if necessary, just contact your sales representative.